You don't have to look outside the fashion world to see where designers get some of their inspirations... you just have to look into the past. This sketch is not by Claude Montana or Giorgio Sant Angelo. It's not even 1985. It's 1945, and the designer is Cristobal Balenciaga. The exaggerated shoulder with its stitched detail is the only hint of Balenciaga's encompassing cocoons and capes that would arrive in the following decades. Yet this practical and rather anonymous design of his became a quintessential look of late 80s & early 90s boutique lines. 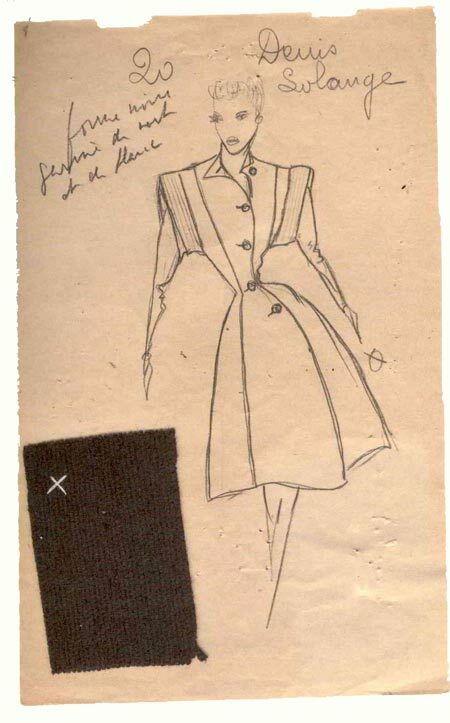 Dresses like this were produced by the thousands about forty years after this particular one was sketched. It's a classic example of history in repetition... something vintage clothing collectors know all about. Photo Source: Balenciaga Paris edited by Pamela Golbin.